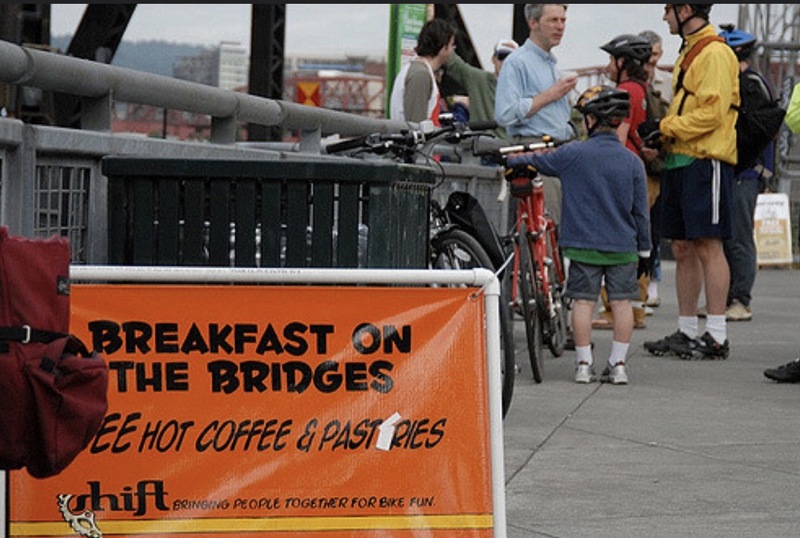 The last Friday of every month Shift volunteers serve breakfast to bicyclists on the Steel and Hawthorne (and sometimes the Tilikum!) bridges (find updates on Twitter). Many bike commuters have come to look forward to hot coffee and delicious pastries on their way to work once a month – and you can’t beat the view! Note, we generally arrive on the bridges around 7:00 a.m. and stay till 9:00. Join us for this fun, community-building event. Stop by on your way to work, school, shopping, or where-ever you and your bike are going. Find us on Facebook and on Twitter at @bonbpdx!